Add extra magnetic PVC panels to your existing pop up display, or have replacement PVC panels to change your graphics and overall message. Use your same pop up display frame at multiple events for different promotions. The banner is made from stiff PVC plastic material to have a great professional finish (choose from matte or glossy finish) with magnetic strips installed on each panel to fit onto the existing pop up frame. 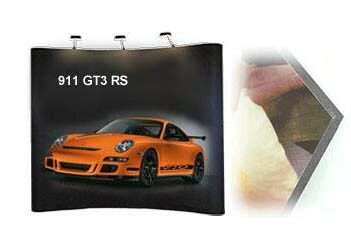 Our banners are priced per square foot, please add the number of square feet you want to your cart (Min. 10 sq.ft.). Any size/shape available--custom order. Please call or contact us for special orders or more assistance.